Posted on September 18, 2012 by Eric Bonnici wrote in Community Events. It has 0 Comment. 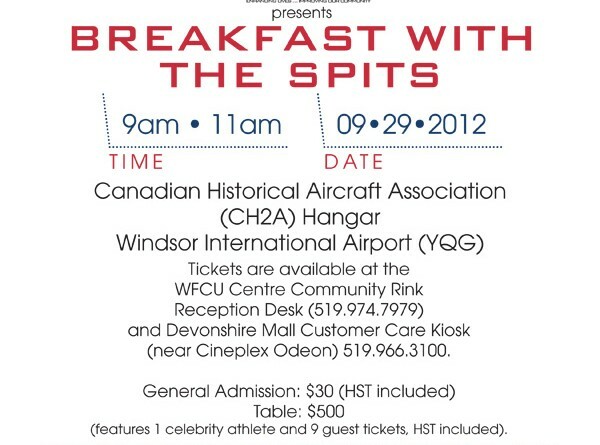 The Windsor Spitfires Foundation will hold the first ever “Breakfast With The Spits” on September 29, 2012. Set to become an annual event, proceeds will be donated to a different beneficiary each year. This year proceeds will support the 2013 International Children’s Games (ICG) to be held in Windsor Essex next summer. The Canadian Historic Aircraft Association will host the event in the CH2A Hanger at Windsor International Airport (YQG) between 9am and 11am. 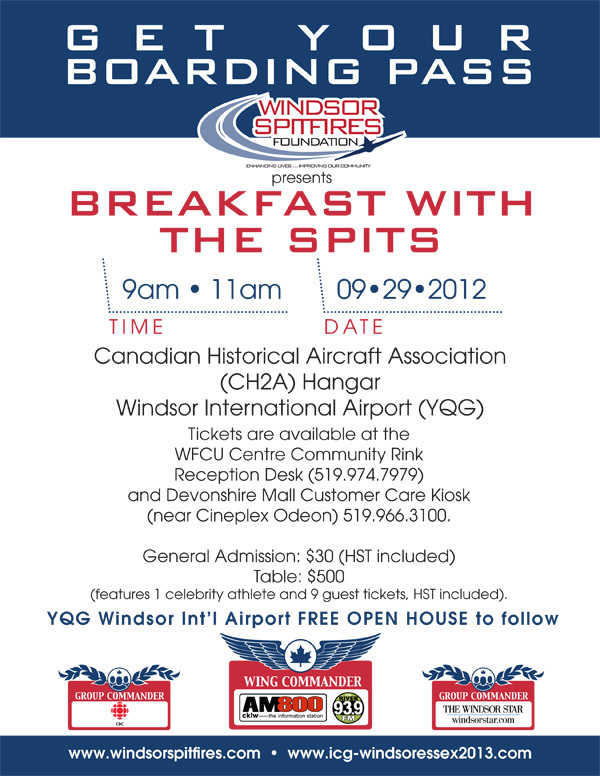 Afterwards, guests are invited to enjoy a free open house between 11am to 4pm at Windsor Airport. Attendees will experience great food, a unique experience, the opportunity to talk with elite atheletes, an open house at Windsor Airport afterwards, and a keynote address from Dr. Anne Snowdon – Chair of the International Centre for Health Innovation at the Richard Ivey School of Business in London, Ontario. The hot breakfast will be served by Grill 55 via donations obtained through collaboration between executive Chef Steve Meehan and the Sun Life offices at the Greenwood Centre on Dizel drive in Windsor and the King street location in Chatham. Grill 55 will serve seasoned scrambled eggs, bacon, sausage, breakfast potatoes, mini-pancakes and maple syrup. The Windsor Internation Airport (YQG) first ever free open house includes aircraft and military equipment displays, tours, classic cars, fly bys, marching bands, kids play area, and airplane rides. Tours included are of aircraft restorations at the Canadian Historical Aircraft Association Museum and the airport maintenance hanger. Throughout the day there will be fly-bys by legendary aircraft including The Harvard, The Yellow Birds and The Hamilton Lancaster Bomber. This will be a fun day for everyone. Coach Bob Boughner calls Breakfast with The Spits “a perfect fit for the foundation”. That’s because it supports their mission to enrich children’s lives in our community by raising funds and promoting the positive impact of sports. In this case, those participating in the Windsor Essex 2013 ICG. 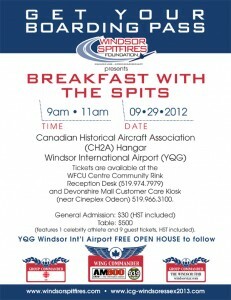 In fact, The Spitfires Foundation’s goodwill mission will soar to young athletes from accross Canada and the world when they arrive in Windsor Essex to compete in next summer’s 2013 ICG. In addition, the thrid annual Sports Day in Canada (another perfect fit with this event) takes place on Sept. 29th. Sports Day in Canada is a national celebration of the power of sport to build community, national pride, improve lives, and encourage healthy active living. It is presented by CBC Sports, Radio Sports Canada, ParticipACTION, and True Sport working with national sporting organizations and their networks of coaches, athletes and entusiasts across the country. “Breakfast with the Spits” is registered in recognition of Sport Day in Canada in order to celebrate with communities across the country.